When I was little, I spent afternoons in Kamla’s Variety, a grocery store at Georgia Avenue and Ingraham Street in Petworth owned by my aunt, Pauline Jagdeo. I used to turn up my nose at the Indian and Caribbean foods sold there, preferring to eat McDonald’s hamburgers instead. 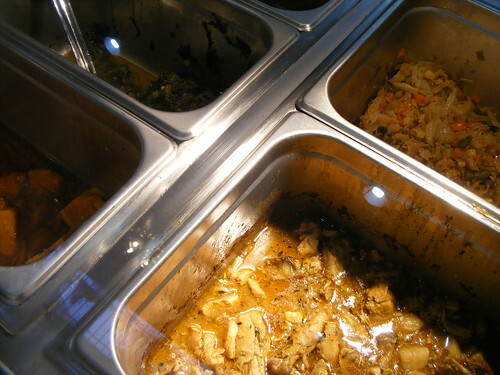 As I grew older, I learned to appreciate the rich flavors of Caribbean food. By middle school, I’d show off my aunt’s roti and curry chicken to my bewildered white friends. 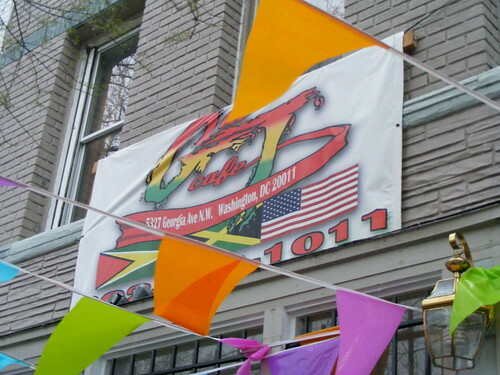 Li'l GT Café, a new Guyanese-Jamaican restaurant in Petworth. Today, my aunt’s sharing that food with the world. After years of renovations and red tape, she’s transformed the market – and the auto repair shop my uncles ran from the basement - into Li’l GT Café, DC's first "Jayanese" restaurant, mixing Guyanese and Jamaican cooking. My cousin Navendra Jagdeo, who helped start the eatery with a small staff of family and friends, wants to have "the best West Indian restaurant in the city serving authentic, home-cooked Sunday dinner meals." When asked why she started a restaurant, Aunt Pauline is characteristically modest. “I eat food, so I figured if I had to eat food, I could feed other people,” she says. Her son, Navendra, says his inspiration came from somewhere deeper. After the untimely deaths of his father and brother, he felt obligated to “step up” and take care of his grieving mother. “The best way that I found to do it was through my love of food. And to feed people. I learned that from my grandmother,” he says. At Li'l GT Café, Aunt Pauline sought to recreate the feeling of Georgetown, the Guyanese capital and my family's hometown before settling here in the 1970's. Photos of friends and loved ones line the pastel-colored walls. In a nod to my family’s mixing of Hinduism and Christianity (the two dominant religions in Guyana), a shelf over the cash register holds statues of Shiva and the Virgin Mary. There are just a handful of tables, meaning the place can get crowded easily. By the doors, a stereo pumps out classic reggae; on a nice day when they’re open, the music mixes with the sounds of Georgia Avenue. The menu’s short and changes daily, but it contains Caribbean standards like salt fish and curry chicken, and sides like roti, polouri, and fried plantains. Noting that a new organic restaurant’s opened up next door – it used to be a Trinidadian bakery – Navendra insists that I mention the veggie plate (“because some people don’t eat meat,” he says). The prices are affordable, with most meals costing less than $10. And everything’s made from scratch. Navendra takes me out back to the newly renovated patio, where my uncles once fixed cars. He gestures to a large grill with flames painted on it. "We have the original jerk chicken from the grill,” he says proudly. Despite Greater Washington’s substantial West Indian population, there are only a few thousand Guyanese, concentrated mainly in the District and Montgomery and Prince George's counties. 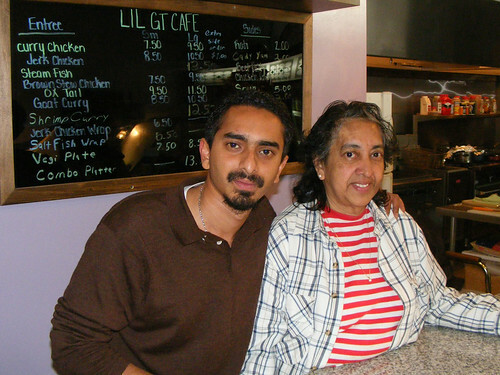 Aunt Pauline and Navendra can only think of two other Guyanese restaurants in the D.C. area: Taste of the Caribbean in Shepherd Park and the Caribbean Market in Takoma Park. As a result, the Guyanese and Jamaican communities tend to stick together. “Half the Jamaicans in DC, I know them,” says Navendra. In the month since Li’l GT Café has opened, business has been steady. A steady stream of neighbors, friends and family come in during the rainy Saturday afternoon I’m there. If anyone working behind the counter recognizes someone walking by, they’ll run out, flag them down, and bring them in. “People are happy there's good, home-cooked meals" to be found, Navendra says, citing “strong support” from the neighborhood. My cousin Navendra and Aunt Pauline at Li'l GT Cafe. That’s especially important on Georgia Avenue, which has long been the heart of D.C.’s West Indian community, home to the yearly Caribbean Carnival, which has been going on for nearly two decades. But a lot’s changed since my aunt bought Kamla’s Variety in 1986, including an influx of affluent, predominantly-white families and fears of gentrification. That’s compounded by Wal-Mart’s plans to build a store at Georgia and Missouri avenues, along with the city’s plan to run a streetcar down Georgia. Li'l GT Cafe is located at 5327 Georgia Avenue, NW (between Jefferson and Ingraham Sts.) in Petworth, just three miles from downtown Silver Spring. They don't have a website yet, but you can find more information on their Yelp page or call them at 202/722-1011. Actually this is not the first jamaican guyanese resturant in the area. FLAVORS OF JAGUYA on Georgia Avenue 2 blocks up from Walter Reed Hospital. Best pastries in DMV area.